UWE have a number of partnership universities across the world; which they work closely with to provide students opportunities to enhance their education and gain UWE accredited degree. At our graduation ceremonies in July, several members of the first cohort of MBA students from Villa College received their degrees. Villa College, located in the Maldives, has become the Bristol Business School’s second largest partnership since the first cohort of students started in September 2015. Students who didn’t attend the UWE Bristol Graduation Ceremonies will attend Villa Colleges’ first graduation in Male in October. 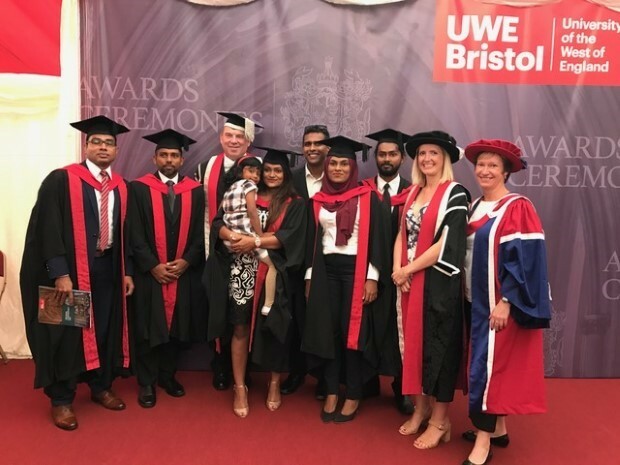 Azeem Haroon, who was the Partnership Lead at Villa College before joining UWE Bristol to study for a PhD in Economics, was there to support all the students who came over from the Maldives to receive their awards. The celebrations were filled with joy and excitement while students congratulated each other on their success. ‘It is with profound delight that I watched online, the first graduates from our partnership being conferred their degrees at the UWE graduation ceremony on the 13th. It warms my heart to see our mission at Villa College realized and to know that a difference has been made to the students. We recognize with pride that a huge milestone is achieved for the Maldivian students through the successful collaboration of UWE and Villa College’. This positive feedback shows how important it is to maintain and develop partnerships with other universities. The fruition of hard work and dedication from the staff at both institutions, is what enables these moments to happen. All staff demonstrate visionary leadership to steer the partnerships to the success we see today – graduations being one of them. To find out more about our partnership with Villa College please see here.